Tax Cuts, Tax Hikes and Everything in Between. What did the Legislature pass in 2018? On Day 44 of Utah’s 45-day legislative session, lawmakers unveiled House Bill 293, 5th Substitute, titled “Tax Rebalancing Revisions”. This bill contained a number of tax changes that affect both individuals and businesses and passed on the final day of the 2018 Legislative Session. 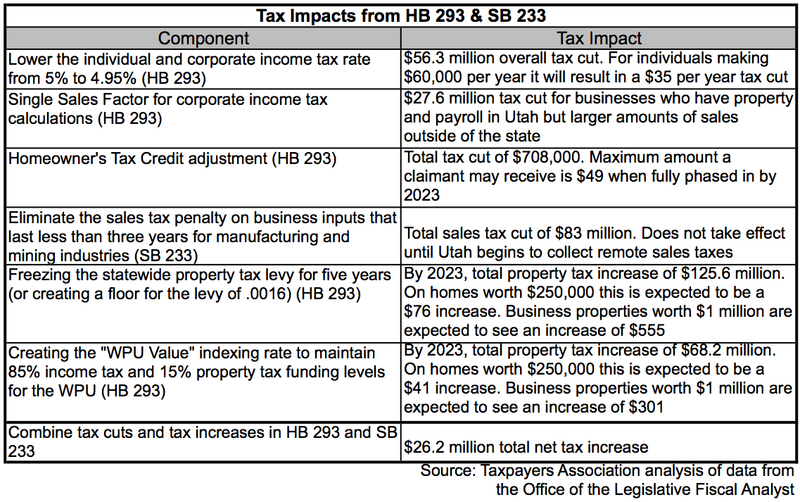 The legislature also passed SB 233 which eliminates the sales tax penalty placed on Utah’s manufacturers and miners who have tools of production that last less than three years. This sales tax exemption is contingent on the United States Supreme Court or Congress allowing the state to collect remote sales taxes and when remote sales tax collections reach $55 million. Creates a static base rate for Utah’s statewide property tax: Sets a floor for Utah’s statewide property tax rate at .0016 for five years. Utah’s property tax system is revenue-based, not rate-based. Property tax rates are changed every year to guarantee government its previous year revenue, dependent on changes in property values. For example, a taxing entity (like a city, school district or state) received $1 million in property tax revenue the previous year. The entity’s property tax rate for the upcoming year would be set collect only $1 million. If property values increase, the rate will drop. If property values decrease, rates will rise in order to reach that guaranteed property tax revenue for the entity. If our example entity wants more than the $1 million in property taxes it has to go through the Truth-in-Taxation process. Under HB 293, a statewide floor for the rate has been put in place at .0016, which would be used against the base. Therefore, if property values continue to rise, the rate will not decrease past .0016, even if that means an increase in property tax revenue to the state. This is in conflict with Utah’s traditional revenue-based system. Instead, the rate will hold at .0016 and generate new revenue for Utah’s statewide property tax, used to fund public education. The Legislature’s fiscal analysts determined this change should raise taxes by $36 million in its first year but will increase to $125.6 million by 2023. The money raised from this increase will be used to equalize school funding in areas of the state that have lower property tax bases and are not able to adequately fund their schools through their own tax efforts. Ties Utah’s property tax levy to education spending: Creates a WPU (weighted pupil unit) value rate in Utah’s property tax code. This new value rate will generate revenue for the state that is equal to 15% of the cost of the increase to the WPU enacted by the Legislature. The WPU is set by the Legislature each year and is loosely used as the measure for how much the Legislature is sending to the school districts in per-pupil spending. This new WPU value rate will now ensure that a ratio for the WPU is funded by the income tax at 85% and property taxes at 15%. When the 85:15 ratio is disrupted, property taxes will automatically increase to maintain the 85:15 ratio. If lawmakers want to use growth in the income tax to increase the WPU, property taxes will automatically increase to maintain the 85:15 funding ratio. The Legislature’s fiscal analysts expect this change to increase property taxes by $18.6 million in FY2019 (the upcoming budget year beginning on July 1) and will increase to $68.2 million by FY 2023. Increases all school district property tax levy caps to .0025. Aligns all school districts in the state to the same cap on their property tax levy. Prior to passage of HB 293, 11 of Utah’s 41 school districts had their property tax levy capped at .0018. HB 293 eliminated the .0018 property tax cap and allowed all school districts to have their property tax cap at .0025. The change does not have an immediate tax impact on property taxpayers but does allow the 11 school districts that had the .0018 cap greater property taxing capacity in the future. Reduces Utah’s income tax rate to 4.95%. Lowers Utah’s corporate and individual income tax rate from 5% to 4.95%. Utahns will pay a little less in income taxes in the future. The reduction in the income tax rate is expected to be a $56.3 million tax cut. Enacts Single Sales Factor for additional industries in Utah. Moves key industries in Utah to single-factor apportionment when calculating corporate income taxes. Phases in a calculation method used to determine corporate income taxes called single sales factor. The calculation increases the emphasis on sales within the state while decreasing the emphasis on property and payroll when determining a business’s income tax. This method incentivizes companies to invest their payroll and property in Utah and produce products that sell nationwide. This calculation method is expected to be a $27.6 million tax cut when fully phased in. Minor adjustments to Utah’s personal exemption and homeowners credit. Limited changes made to Utah’s tax code. The personal exemption change would have no impact on taxpayers unless Congress fails to extend the individual income tax changes made in the Tax Cuts and Jobs Act in 2027. The homeowner and renters credit received minor technical changes. Changes to the homeowner and renters credit are expected to be a tax cut of $708,000. Eliminates the 3-year-life sales tax penalty. Moves Utah away from taxing business inputs on manufacturing and mining industries. Removes Utah’s sales tax charged to manufacturers and mines who have tools of production that last less than three years. Utah has a long-standing tax policy of taxing the final product and not the items used to make the final product. This tax change aligns this portion fo the tax code with that tax policy. This legislation is contingent on the United States Supreme Court or Congress allowing Utah the ability to collect remote sales taxes from out of state online retailers. Once Utah has collected $55 million in remote sales taxes, the bill will go into effect. This change to the sales tax code is an $83 million tax cut ($58 million to the state and $25 million to cities and counties). You can read HB 293 by clicking here. You can read SB 233 by clicking here. Note: Additional tax changes may come in the future due to changes made in SB 136, legislation dealing with transportation funding. You can read that legislation by clicking here. You can review our 2018 legislative watchlist by clicking here.